Twin Cities reader Matt sends along this link to another kind of novel traffic calming (at least, “informal” traffic calming), a series of unorthodox signs by artist Steven Woodward, who, is apparently, former artist in residence with the St. Paul Public Works Department (and how great it is that the public works department has an artist in residence?). The artist’s goal is to help give neighborhoods a sense of place, at least in the eyes of passing drivers. My personal favorite is the one above, as it makes me wonder if the persuasive powers of eye contact, even simulated eye contact, might induce drivers to slow down. In any case, it’s certainly more interesting than a “Resident Parking Only” sign. 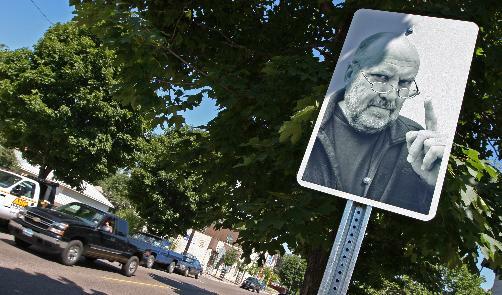 This entry was posted on Sunday, August 24th, 2008 at 1:42 pm	and is filed under Traffic Culture, Traffic Signs, Traffic Wonkery. You can follow any responses to this entry through the RSS 2.0 feed. Both comments and pings are currently closed.